Sue Benner, with Body Parts 3: Cuffed. With an artist’s eye, I see the world through a scientific lens. While pursuing a degree in molecular biology and a master's in biomedical illustration, Sue Benner created her vision of the microscopic universe in painted and quilted textile constructions. Her early work propelled her to become a studio artist in 1980, working primarily in the medium that later became known as the Art Quilt. An innovator in her field, Benner creates complex dyed and painted textiles combined with recycled fabrics to form collaged fields of pattern, color, and beauty. Her work is shown world-wide in galleries, US embassies and museums including the International Quilt Study Center and Museum, National Quilt Museum, Neville Public Museum and the Museum of Geometric and MADI Art. 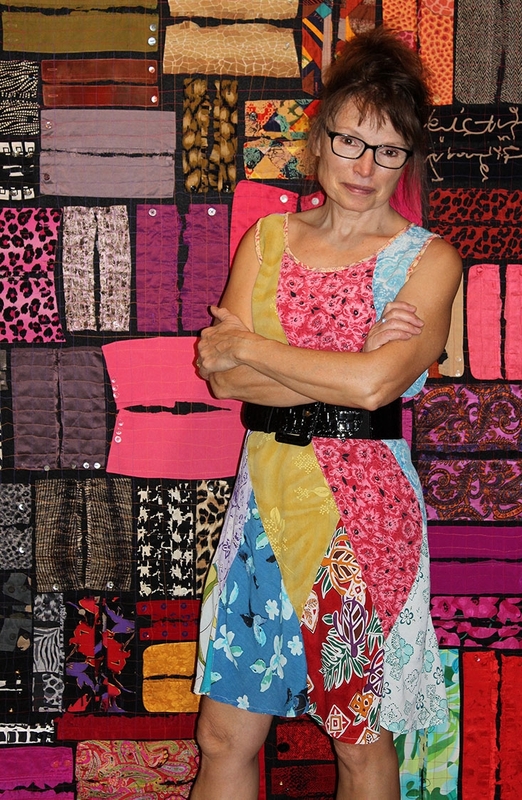 Her quilts have been juried into Quilt National eight times, recently winning the Most Innovative Use of the Medium award. She served as a juror in 2009. A respected educator, she lectures and teaches workshops nationally and internationally in the areas of surface design, textile collage, fused quilt construction and artistic inspiration. She is well known for her communications skills and her ability to bring her knowledge of design and technique to the classroom experience. Living in Dallas, Texas, with her husband, J. Craig Jett, Benner works in her studio custom-built in the backyard of their family home. They have two grown sons, Kellan and Calder Jett, who were the muses for many of her early series. Although she has lived in Texas for over 40 years, part of her heart resides still in her home state of Wisconsin. Benner with iron, an essential tool in her studio! My love affair with fabric began with my first memories of the clothes my mother, Joanne Hagene Benner, made me. Uncannily, I can recall the exact hue, fiber content and weave. In the ensuing years, my mother taught me to sew, carefully and creatively. My father, Milt Benner, always had a pencil in his hand or behind his ear, drawing on napkins in restaurants and painting on the weekends. I now recognize how creativity was imbedded in everything he did. I have kept my maiden name in his artistic honor and memory. While in college and immersed in the subjects of calculus, organic chemistry and cellular biology, I was continually drawn to the visual. I saw pattern everywhere: math problems danced in a dimensional space, organic molecules were drawn in structural diagrams, and biological cells stacked themselves in lovely arrays. When forced to satisfy a few humanities credits, I took an art history course that changed the direction of my life dramatically. Surface design, drawing, painting and more art classes followed. My education in molecular biology and biomedical illustration still figures in my work with a deep sense of structure and organizing principles. "Form follows function," and the resulting form is usually beautiful in its solution. My experiments continue in my studio. I revel in the simple act of placing one fabric next to another. It’s a good way to begin, and the work continues. Visions Art Museum, San Diego, California. 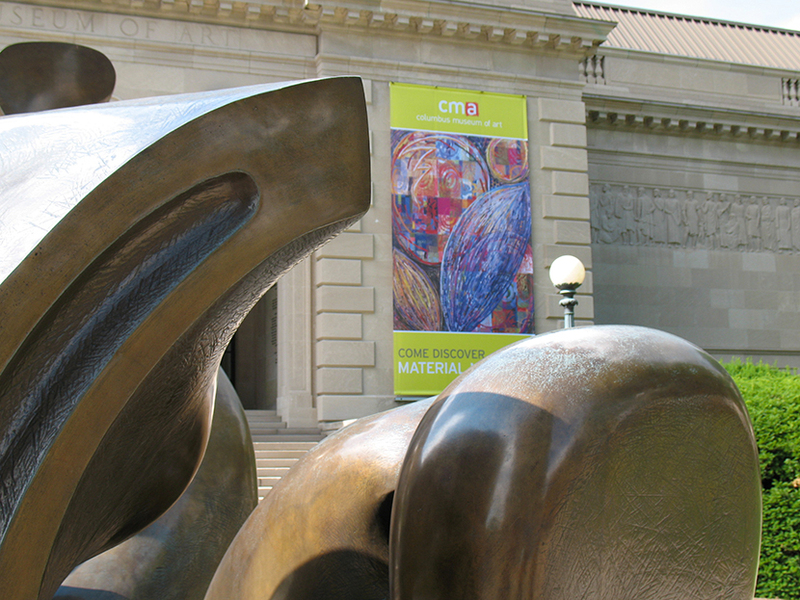 Benner in front of Material Matters banner,announcing exhibition at the Columbus Museum of Art, 2008. See more Cellular Structures under Circles & Cells. Quilts: The New Geometry, Museum of Geometric and MADI Art, Dallas, TX; curator. Read more about Quilts: The New Geometry. Art in Embassies Exhibition, United States Embassy Ashgabat, Turkmenistan. Benner on reconnaissance trip to Palo Duro Canyon. Palo Duro Canyon: Fortress Cliff, detail. Read how this commission came to be and see how Benner went from photo to sketch to finished art. 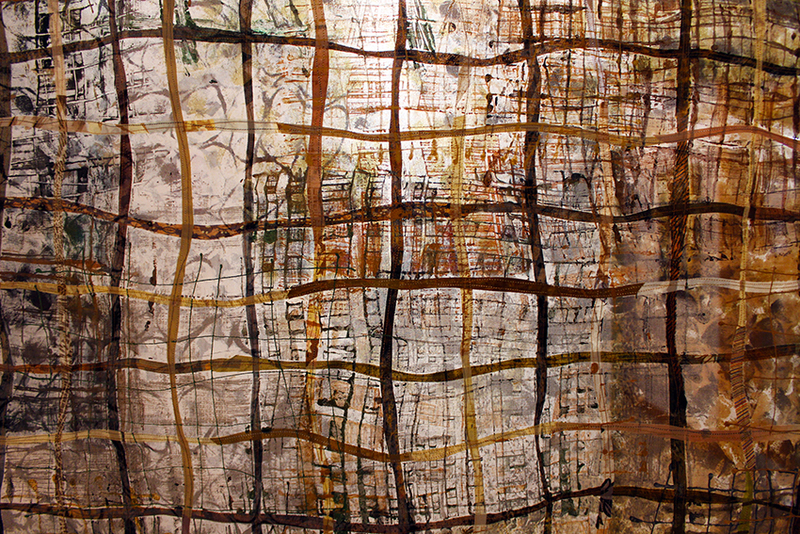 Art Quilts International: Abstract & Geometric.